I make a roast chicken with tarragon, lemon and garlic that is one of my all-time favorites. I wondered about doing something similar on the grill with kabobs but thought the marinade would need a boost to intensify the licorice flavor. The logical addition seemed to be a licorice liqueur, I used Sambuca. I wondered what to call this recipe, Licorice Chicken Kabobs came to mind and I Googled to see if I was crazy, but lo and behold there are a few licorice chicken recipes out there! I chose zucchini and yellow summer squash in lieu of the ubiquitous bell peppers. On the first try, the squash pieces were undercooked. The next round I steamed the squash for a few minutes. Please don’t boil; these vegetables have a high water content and get soggy when cooked directly in water. The best size is one-half inch slices. If the slices are larger than a half-dollar, cut in half horizontally. The squash I had on hand were of varying sizes, from small to gargantuan, and therefore I had a mix of round and half-moon squash pieces. It worked just fine. Kabob recipes generally call for one-inch cubes of meat. I find this too small. Timing both the meat and the vegetables on the same skewer is tricky and slightly larger pieces of meat are better. I cut the breast into two-inch pieces. 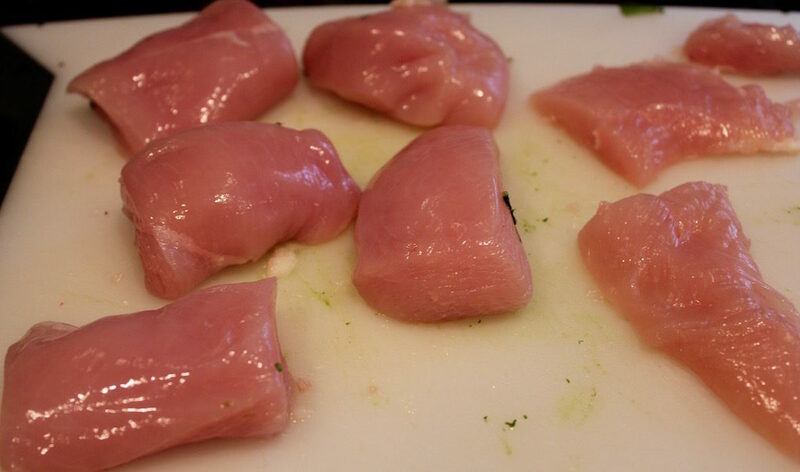 The thighs are thinner and I cut each into four pieces and then doubled up when placing them on the skewer. This worked well in terms of getting both the meat and the vegetable cooked through without drying out the chicken. This is not a highly acidic marinade and can be made and applied to the chicken up to a day in advance. To soak or not to soak the wood skewers. I’ve tried it and it fails miserably. The skewers are thin; they dry out quickly and burn. Keeping a lower temp keeps them from charring up too much and helps you control the cooking of the chicken. I’ve recently seen flat skewers, genius idea, and can’t imagine what took so long for someone to invent them! If all you have are the skinny round ones, double up and the kabobs won’t twirl when you turn them over. Temperature is very important when grilling kabobs. Yes, you want to get a tasty initial sear on the meat, but these kabobs need a little time on the grill to cook through and remain moist. I started with a hot grill (about 500ºF). As soon as I put the kabobs on the grill, I set the temp to low (I’m using a gas grill) and left the top open. I did get some nice searing, and the chicken was cooked through and moist and the vegetables were tender with good texture, not mushy. I turned the kabobs about every minute or so for about 12 minutes. Try our macaroni salad with these kabobs! Fire up the grill and skewer yourself a tasty dinner for any night of the week with our Licorice Chicken Kabobs and lots of veggies! While the kabobs rest, raise the heat on the grill and cook some corn on the cob. These are great at room temperature – so pack them up for a picnic. 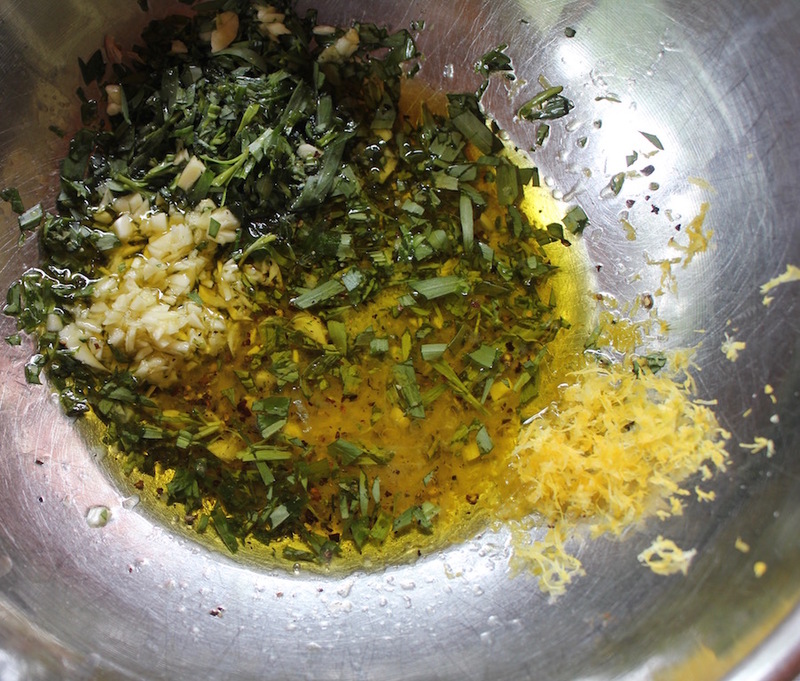 Whisk together the oil, tarragon, liqueur, garlic, lemon zest and juice, salt and pepper. 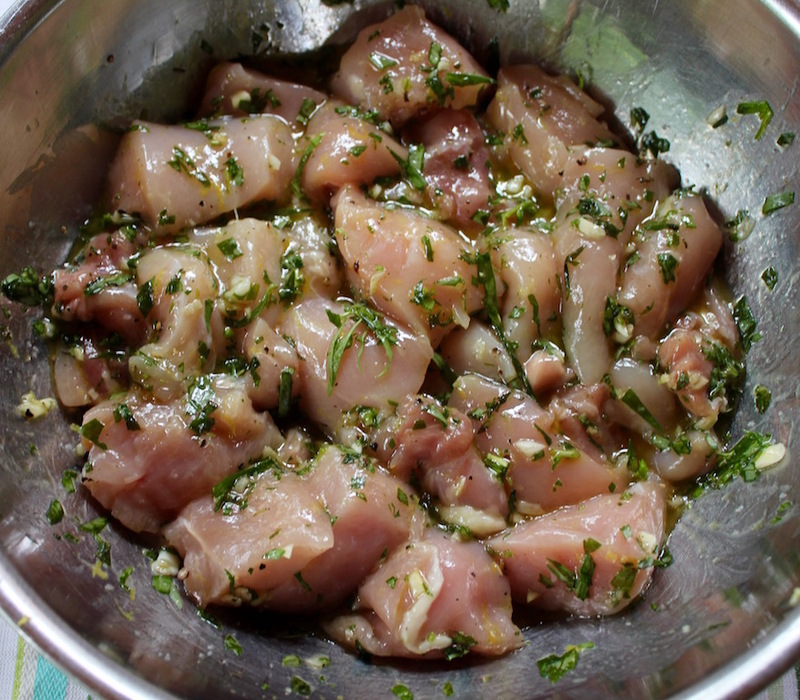 Toss the chicken pieces in the marinade, cover and refrigerate for at least one hour. This is not an acidic marinade and an overnight soak is okay. Place the squashes in a steamer basket of salted water, bring to a boil and cook for three to four minutes, until the squash gives a little when poked with a fork. Drain and rinse with cold water, toss onto a baking sheet lined with paper towel to soak up the water. 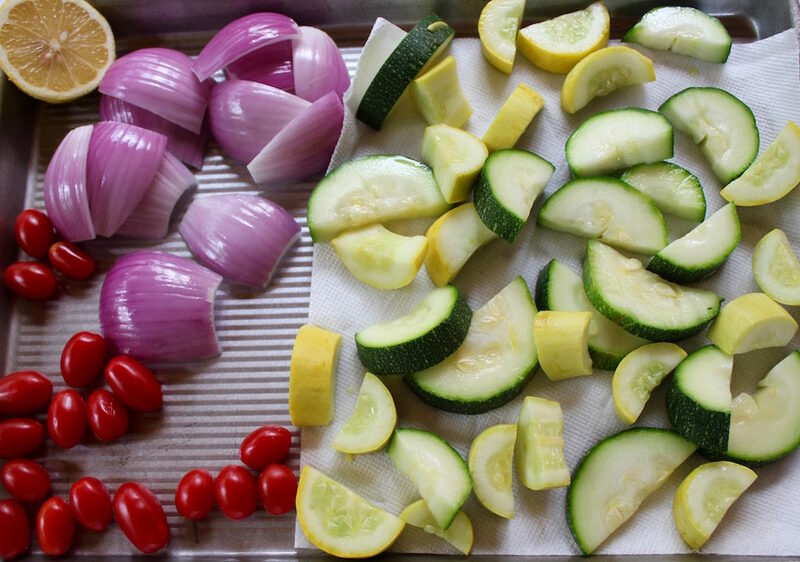 Place the tomatoes and onion sections on the sheet as well. Use two, eight-inch wood skewers about a half an inch apart and begin to slide on the meat and veggies. You can do this in any order you like. My preference is have a cherry tomato on each end and in the middle, purely for esthetics. The onion goes on next, place the concave side facing in so it hugs the chicken. After the first piece of chicken, slide on summer squash, more chicken, zucchini, tomato, zucchini, chicken, summer squash, chicken, onion and tomato. 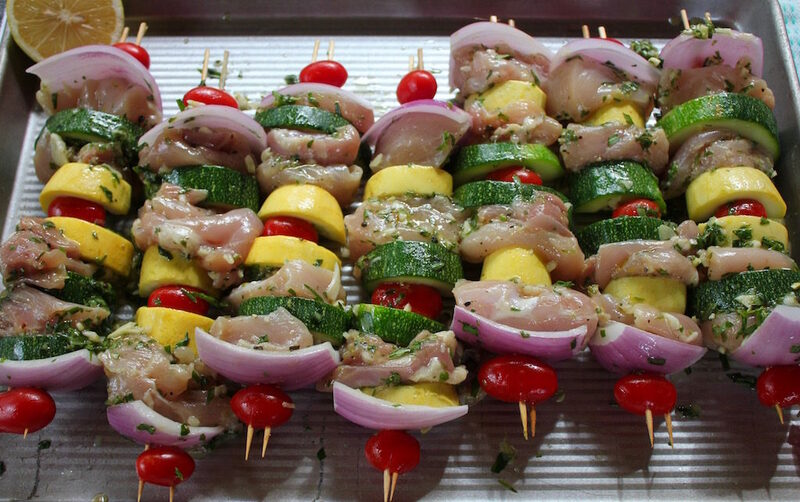 Lay the skewers on a baking sheet and drizzle with any remaining marinade. Preheat your grill to high. As soon the kabobs are on the grill, set the temp to low and leave the top open. Turn them about every minute or so for about 12 minutes. Remove to a serving platter, cover and let sit for a few minutes. Long enough to grill some corn on the cob, but jack up the heat first!